I've recently discovered the source of the various powers that garden fairies seem to have. Having this knowledge has given me greater appreciation for rainy days and for having a variety of flowers blooming in my garden. I have somewhat been sworn to secrecy as to where I obtained this knowledge, I made it up, so all I can say is you can believe me or not. If you choose not to believe me, I will harbor no ill-will against you, though I'd be careful in your garden the next time it rains. And for good measure, just in case, be sure and plant a variety of flowers throughout your garden. Let's begin with the overall concept. It seems that garden fairies receive their powers, of various and sundry types, by sitting and lying under flowers when it rains, waiting for droplets to form on the petals and slowly let go, falling straight onto the garden fairies' tongues and into their mouths. The power the garden fairies receive depends on the type of flower. For example, garden fairies get their power to flit about and sometimes fly from raindrops that fall from Aquilegia or Columbine blooms. 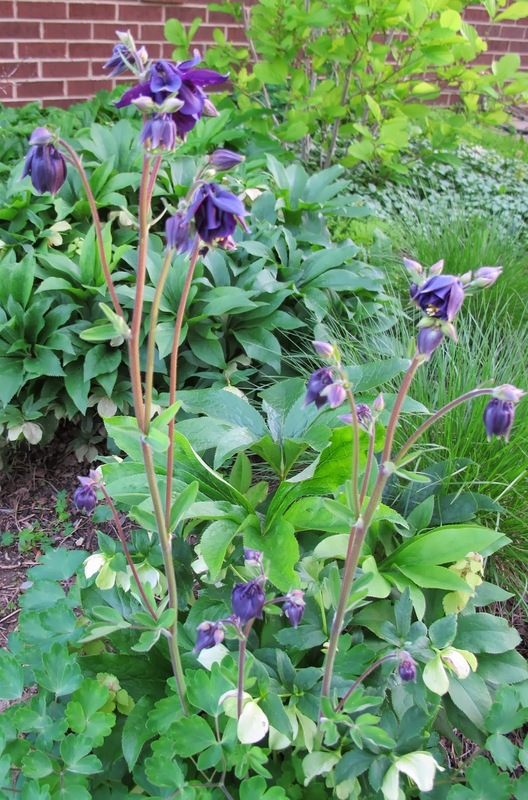 Aquilegia, as you know is derived from the Latin word for eagle, aquila, and columbine is derived from the Latin word for dove. Most garden fairies need just one drop of rain from a columbine petal to be able to flit about for life. The garden fairies get their ability to get out of thorny situations from the raindrops that fall from rose petals. There has been more than one garden fairy who has had to go back for multiple raindrops from roses, as this power diminishes each time it is used. During a gentle rain, it is almost always standing room only under any blooming rose. Every garden fairy knows that a cure for most any type of sadness is to sit or lie under a sunflower in the rain and wait for a big drop of rain to hit them on the head and slowly drip down their face until they can stick out their tongue and swipe it into their mouth. It's not easy to do, they say, but well worth the trouble. When it comes to courage and strong hearts, the garden fairies look for droplets of rain falling from Digitalis, foxglove. They have to be very careful not to get too much of these droplets. Many a garden fairy has found that the rain droplets from Galanthus, snowdrop petals help them stay warm through the final weeks of winter and in general help them wake up from winter, when they mostly slumber. To ward off evil spirits, garden fairies prefer the raindrops that fall from the blooms and leaves of the witch hazels, Hamamelis. This is one of the rare plants where the droplets of rain falling from the leaves can provide as much power as those from the blooms. There are many other examples because most every flower is associated with a specific power that comes from the droplets of rain that fall from its blossoms. As any garden fairy knows, the droplets have to fall right into their mouths to be effective. Bottling up the raindrops causes them to lose all their special qualities and such bottles of raindrops are as worthless as a bottle of rain. It is also commonly known that during periods of drought, droplets of water from sprinklers and irrigation systems will work, but are never quite as effective as actual raindrops. I am pleased to pass along this knowledge made up stuff and hope that you will think of it the next time it is raining on your garden. I hope you will remember that the rain is good for the plants, and is good for the garden fairies, too. In any garden where there are flowers, if you go out in the rain, you will find garden fairies running, skipping, hopping and flitting from bloom to bloom, hoping to catch on the tips of their tongues, raindrops sliding off flower petals. It is raining here in Mississippi this morning, so everyone is happy in the garden. If we finally had rain I'd join the garden fairies slurping up those revivifying drops. Thank goodness we grow all of those plants mentioned, Carol, but we sure could use some more rain! I fear for the fairies here, don't want them to lose any powers!